Beyond reach is a new Watchuseek series which focuses on rare and high value luxury watches. Most of the watches we will show will be out of reach even if you do have sufficient funds to afford them as they are usually part of extremely small limited editions spoken for before they even leave the manufacture. At this level of haute horology, it’s not only about how much you have got, but how much the watch manufacture values you to allow you to acquire one of the precious few pieces. Only twelve of these exceptional watches – and bear in mind it takes 30 days just to assemble each one – can be crafted in a year. It goes without saying that every single timepiece is embellished by hand to a degree of perfection that can hardly be surpassed. For example, the decoration of the delicate tourbillon bridge alone, the part with which the tourbillon cage is mounted on the dial side, is a two-day project for A. Lange and Sohne’s most gifted specialists. For the manual circular graining process involving the plates and bridges, up to 14 different special tools are employed to obtain the desired perlage (swirls of overlapping circles) effects. You can only begin to grasp the sheer intricacy of the watch when you consider the delicate L903.0 calibre movement and the chain and fusée movement that drives it. The movement comprises 465 parts – or 1097 parts with the chain. It has 41 rubies, and is precision-adjusted to 5 positions. Six gold chatons are screwed to the untreated German silver plates and bridges. 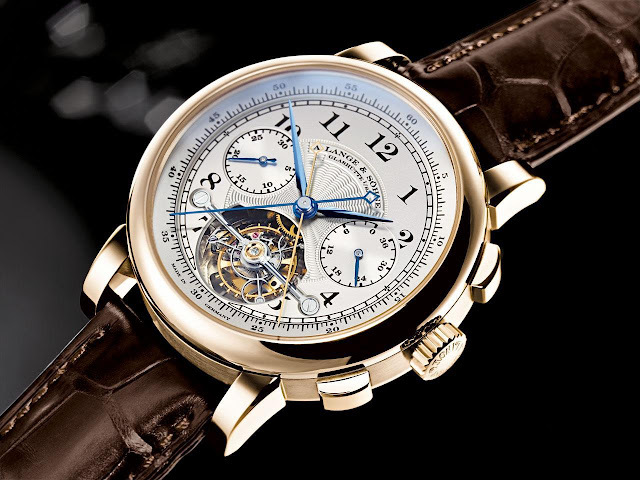 To overcome the fact that a mechanical watch does not exert the same power unwound as it does when fully wound, the barrel and the fuse in the A. Lange and Sohne Tourbograph are connected by a delicate chain which alone consists of over 600 parts. While the watch is being wound via the crown, the chain is wound up on the tapered fusée and the spring in the barrel is tensioned. 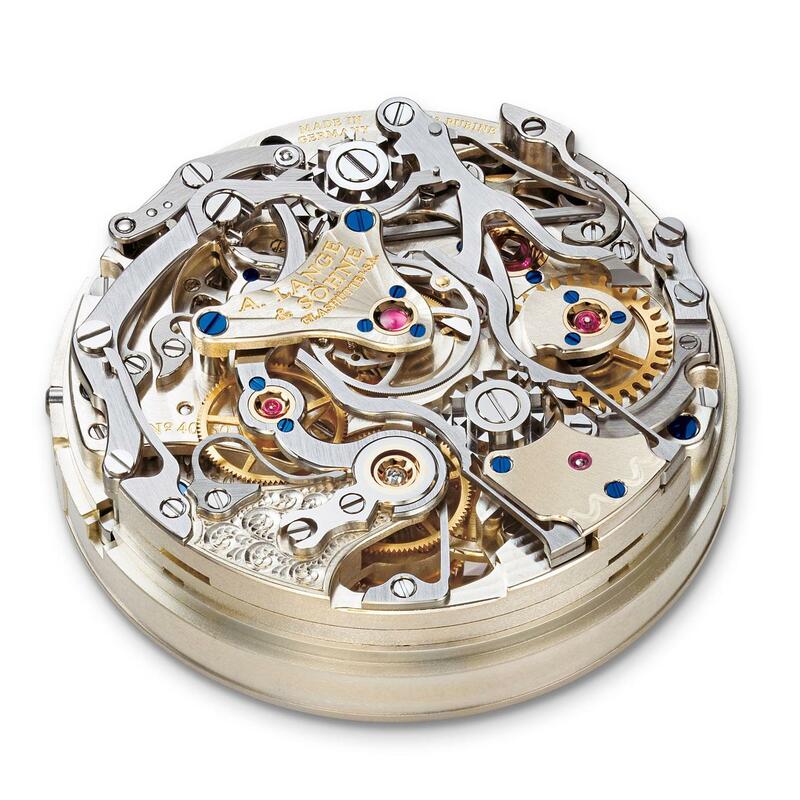 Then, the spring’s power is delivered to the movement via the fusée and thus with constant torque.There is also a planetary gear train comprising 38 parts which enables the movement to keep going even when the watch is being wound – thereby maintaining the accuracy. The A. Lange and Sohne Tourbograph features the very best of mechanical timing technology, the rattrapante function, which is located at the third push piece at 10 o’clock. The mechanism, positioned directly behind the sapphire-crystal caseback enables the two delicate superimposed twin sweep seconds hands to allow additive time measurements of up to 30 minutes as well as – concurrently – the measurement of any number of lap times. The Tourbograph ‘Pour le Mérite’ in its 41.2-millimetre case, will bestow upon its select owners the certainty, with each glance that they have acquired an authentic and extremely precious work of art. A. Lange and Sohne has considered every last detail. All edges have been chamfered and polished. Even hidden surfaces are circular-grained to perfection, or meticulously decorated with beautiful patterns which take up to five days. Hardly surprisingly, only 101 of these watches will ever be produced. The first 51 Tourbograph ‘Pour le Mérite were made in platinum. A second series of 50 watches will be cased in gold. And the price for the platinum model assuming you could get hold of one? US$580,000.